The production of nuclear fuel passes through different technologically complex processes each consisting of many steps. Thus in addition to the nuclear power plant producing electrical energy a waste infrastructure is required. Specific front-end e. q. fuel supply and the back-end e. q. fuel disposal facilities must be considered in dependence on the fuel cycle option implemented. 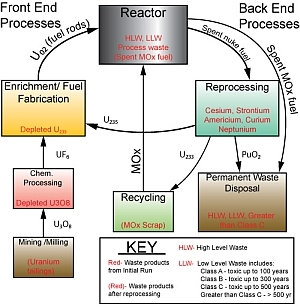 (5) interim storage and cooling of spent fuel; (6) reprocessing of spent fuel to recover uranium and plutonium (optional); (7) fabricating recycled fuel for added energy production (optional); (8) cooling of spent fuel or reprocessing waste, and its eventual transport to a repository for disposal in secure long-term storage. FC studies are focused on optimal fuel management which is determined by the mass flow schedule while producing the fuel with given annual capacity constrains, inventories of radioactive materials as contained in the used fuel remaining in the interim storages, the mass of reprocessed material to be recycled (if any) limited due to available annual reprocessing capacities, the radiological impact and heat load of used fuel, its radiotoxicity and the amount of spent fuel to be disposed off. Finally deep economic studies are done for the policy makers and the non-proliferation investigations are performed to reduce the risk. Apart from knowledge in nuclear physics, reactor theory, neutron physics, chemistry of separation processes etc. 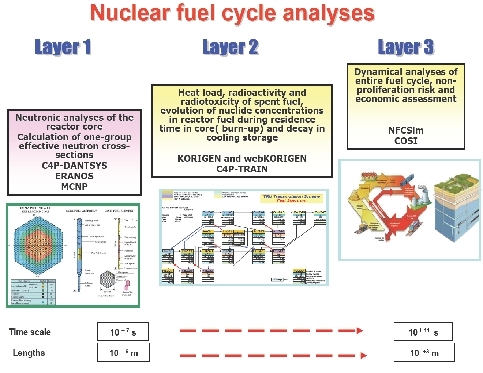 the nuclear fuel cycle analyses requires skills in handling systems of codes in order to perform reliable evaluation. A suite of software tools available in IKET can be subdivided according to their computation task into depletion codes like KORIGEN or webKORIGEN, heat generation assessing codes like CALOR or C4P-TRAIN, full fuel cycle simulation codes like COSI or NFCsim. Reactor specific data libraries are prepared using coupled depletion and neutronic calculation scheme (ERANOS). APOGENE code is used to process the energy dependent neutron cross-sections into effective one group reaction rates by employing the collapsing procedure. A key issue is the transition towards the internationalization of nuclear fuel cycle on the regional or even global level in order to implement the partitioning and transmutation recycling strategy in sustainable manner saving resources, reducing proliferation risk and minimizing the amount of nuclear waste to be disposed off. "Analyse des nuklearen Brennstoffkreislaufes und Energieszenarien"